Everyone knows the feeling of looking in the mirror after a long day and being utterly terrified at the reflection staring back at them–smudged mascara, faded lipstick, foundation melting off your face… the horror! If you’re like us, your days can get pretty hectic. Whether you’re a student or a businesswoman or a mom, you really can’t devote much time to touching up your makeup, which means, more often than not, at the end of the day you end up asking yourself: “Did I really walk around looking like this?” How much easier life would be if makeup could stay looking as fresh as when you first applied it. 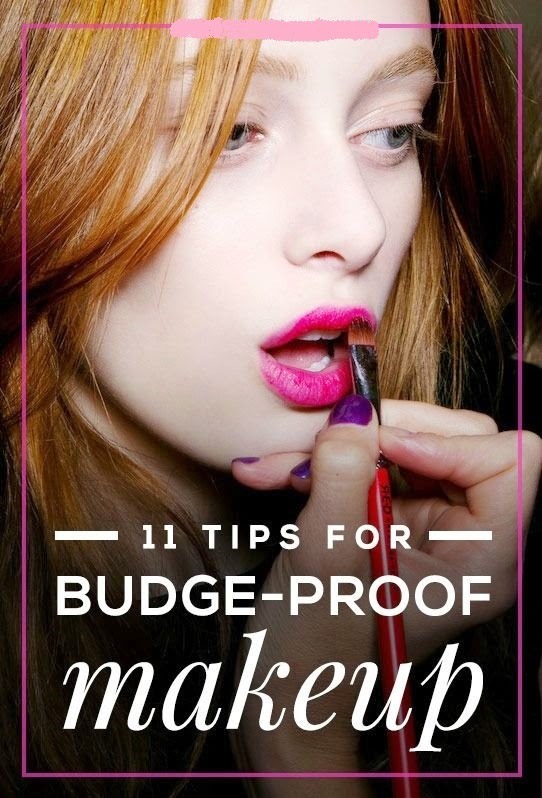 Unfortunately, it can’t–but we do have some awesome budge-proof makeup tips that will have you still looking pretty fabulous at the end of the day. When it comes to long-wearing makeup, prep is key. This means knowing your skin type and what kind of environment you’re going to be dealing with all day. If you’re dry, make sure you’re moisturizing properly. If you tend to get shiny, a mattifying primer will keep oil at bay. Nurturing Force’s Blot Out Offensive is a must-have in all makeup artist kits for it’s killer shine control, so try some for yourself. If you know you’re going to be somewhere hot and muggy, Mehron’s Skin Prep PRO has got you covered. This product is a favorite of performers like clowns and dancers and is known for its ability to prevent perspiration and keep makeup in place all day. 2. Try a wax based foundation.If you know you have a long day coming, you want your makeup to be able to withstand anything: water, sweat, tears–you name it. While there are many great long-wearing formulations you can pick up at your local drugstore or Sephora, the majority of them are either water or silicone based. There’s nothing wrong with this, but if you want staying power, then wax based formulas are where it’s at. Wax based foundations are trickier to find but are more oil and water-resistant than your standard foundation, meaning more staying power for you. Our favorite is the Maqpro Fard Creme Foundation. 3. Set your makeup.This goes without saying. The one surefire way to get your makeup to last longer is to set it with some powder. This step is a must for anyone with oily skin, but can also benefit those with dry skin especially if you’re going to be in warmer climates. We suggest using a colorless powder, like Ben Nye’s Neutral Set, and dusting it only in the areas where you really need it in order to lock in the makeup but to avoid that cakey look and feel. 4. Layer cream and powder cheek products.If you want your face to have that lit-from-within glow all day long, layering is key. The same principle for foundation and powder applies here: First, apply the liquid or cream cheek products of your choice (blush, bronzer, illuminator, etc.). Then, layer on top with their powder equivalents. The cream products have awesome staying power as it is, but when set with a powder they’ll become pretty much budge-proof. 5. Choose brow products carefully.When it comes to achieving bulletproof brows, there are quite a few options. If you like using brow powder, try swiping some eye primer through your brows to keep them from smudging and fading. If you like brow pencils, try one with a wax-based formula, like Shu Uemura’s Hard Formula Brow Pencil. Like we talked about before with foundations, anything wax based is more smudge and water resistant. If you’re more into brow creams and gels, check out NYX’s Eyebrow Gel. It’s a liquid brow formula that goes on like a dream and seriously does not move. Seriously, don’t skip this step. An eye primer will prevent your eye shadows from creasing and will make them stay in place all day. It doesn’t matter if it’s for a night out or if you’re going swimming, your shadows won’t budge with this stuff. 7. Use cream shadows.The beauty of cream shadows is that they go on smoothly, blend like a dream, and set. They can easily be applied with your fingers, cutting application time in half. Most formulas are smudge-proof and waterproof, so you really can’t go wrong with them. Our favorite? Make Up For Ever’s Aqua Creams. 8. Prime and set your eyeliner.Eyeliner smudging has to be the #1 problem we deal with on a daily basis. Luckily there’s a way to fix that. Make sure you’re using a good waterproof eyeliner, like Rimmel London’s ScandalEyes Waterproof Kohl Kajals. These pencils are creamy enough to use on the waterline, but can also be applied with a brush as a gel liner. If the liner alone isn’t cutting it for you, there’s another trick you can do to keep it in place. Take a Q-tip and run it along your waterline, soaking up any excess moisture. Then, swipe a small amount of eyeshadow primer in the waterline, apply your eyeliner pencil, and set it with a matching powder eyeshadow. You can also set your liquid or gel liners on your upper lash line with powder eyeshadow for maximum staying power. 9. Waterproof mascara.This one is pretty obvious, but come on, nothing will look better at the end of the day than a waterproof mascara. Not only will it not run, smudge or flake, but it will also hold a curl if you have pesky, straight lashes. There are so many amazing formulas on the market; it’s really just personal preference. If we had to make a recommendation though, it would have to be any of Maybelline’s waterproof formulas–affordable and bulletproof. 10. Blot and powder your lipstick.Once again, in the case of lipstick, layering is key. No matter what color you’re using, start off by lining and filling in your lips with a lip pencil. This will create a base and will prevent the color from bleeding. Then, apply a thin layer of lipstick and blot. Place a thin tissue over your mouth and dust some loose translucent powder on top of it. The tissue will absorb any excess moisture while the powder helps lock everything in place. Repeat 2 or 3 more times for gorgeous lips that will last for hours. 11. Finish off everything with a setting spray.If you’ve never used a setting spray, it’s about to become your new best friend. This finishing spray locks everything into place, refreshes your skin, and cuts down any excess powder. A cult favorite is the Skindinavia Makeup Finishing Spray, but if you want something even more heavy duty, check out Ben Nye’s Final Seal–it’s used by performers and is specifically designed to turn your makeup waterproof, smudge-proof and resistant to sweating and harsh weather.